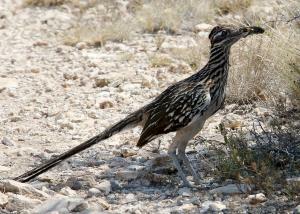 On the Chaparral Trail, this Roadrunner was catching some shade with a grasshopper in his beak. As I approached, he ducked into a bush with his lunch. Temps started at 80, ended at 95. Sunny with some high clouds, steady southerly breeze. The Mockingbirds were out in force today as they were the only birds I saw during my hike with two exceptions; an Oriole and a Roadrunner (photo attached). The trails were all groomed and easy to follow. As mentioned in earlier posts, the drought continues and the soil on the trails is either gone or thinning. In a few spots, you have to be cautious due to loose soil which could cause a fall - not a happy event. There were a few groups of mountain bikers on the trails and a solitary runner, otherwise the trails were mine.